Produced by 4th generation cheesemaker Chris Roelli at Roelli Cheese Haus, which is tucked away in the southwest corner of Wisconsin, Red Rock is a 6-month aged firm cow’s milk cheddar with blue veining that we are really excited to share with you. But first, a bit about the cheesemaker. 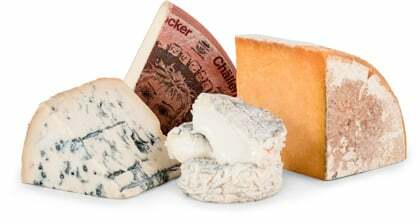 It’s no surprise that with a pedigree like his, Chris Roelli makes great cheeses. 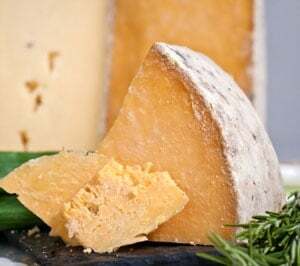 It all started when his great grandfather Adolph Roelli emigrated from Switzerland to Lafayette County, Wisconsin, and began making cheese in the early 1920s. Chris’s grandfather Walter and his father Dave continued in the tradition, and after the closing of their commodity cheddar factory in 1991, Chris reopened the small artisan factory in 2006. And we’re so very glad he did. As the name suggests, Red Rock presents a truly eye-catching hue. This annatto-tinted, 3-6 month cave-aged cheese is firm, but the creamy paste has a few striking blue bolts of color (and flavor) running through it. But it’s not just beautiful to admire on your cheese board, it’s also got a delicate and delicious flavor profile. This naturally bloomy-rinded, traditional cheddar recipe adds a touch of blue which doesn’t dominate the flavor profile, but rather floats above and lingers on the finish. Cheddar meets blue and we love their baby! So will you. Consider pairing Red Rock with your favorite tawny port, Cabernet Sauvignon, or cider.